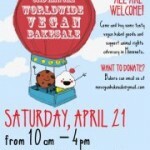 World Wide Vegan Bake Sale – Twin Cities Style! Update: Huge thanks to Celeste Hill and Melissa Swanson, World Wide Vegan Bake Sale – Twin Cities Style organizers, and all the volunteers who staffed the sale. 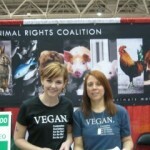 Because of all your hard work we raised over $850 for animal advocacy programs in Minnesota. 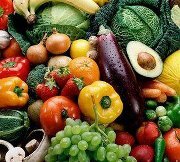 We were also thrilled at the many new people who stopped in who were considering a vegan diet and wanted to learn more about it. 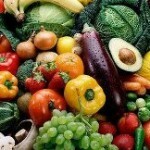 Delight in the wide assortment of amazing vegan goodies – all the delish, none of the effort! 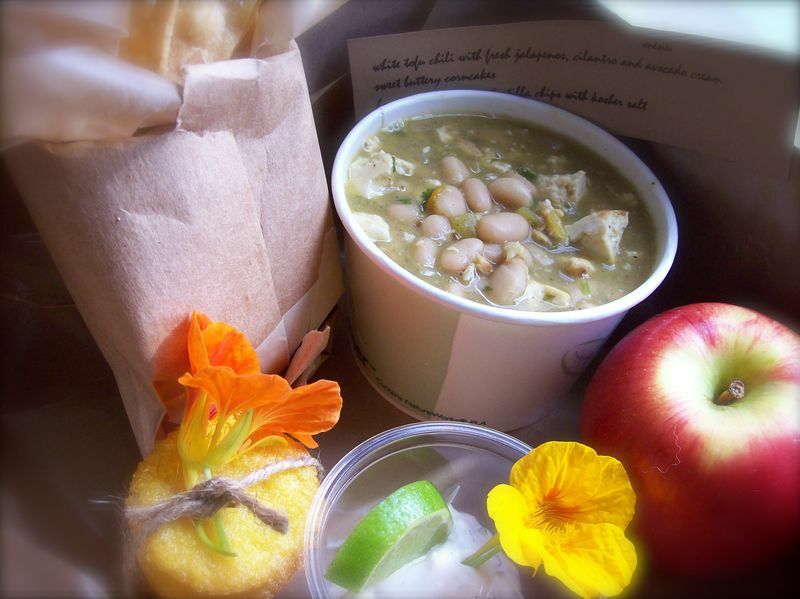 Make sure to bring a container to tote home all the homemade goodness. A human who is able to stick to buying “just one” treat at our extravaganza of sweetness doesn’t seem to actually exist. 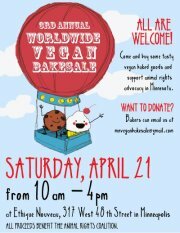 Never been to one of our Worldwide Vegan Bake Sale events? Make plans to attend as it’s not to be missed! We kick off at 10am and the sale runs until 4pm. That’s 6 whole hours of deliciousness! The Melissas make a great team! 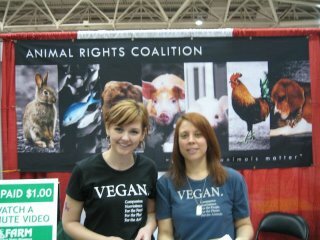 Thanks to all the volunteers who staffed the ARC booth at the two-day Pet Expo at the Minneapolis Convention Center. We had 91 people view a video about the treatment of animals on farms and gave out over 800 pieces of literature. Great job, ARC Outreach Team! ARC is partnering with FARM on the Pay Per View Program, an innovative new outreach strategy where people are offered $1.00 to watch a 4-minute video. Pay Per View exposes the public to the harsh reality of animal agriculture in a way that most other outreach cannot. 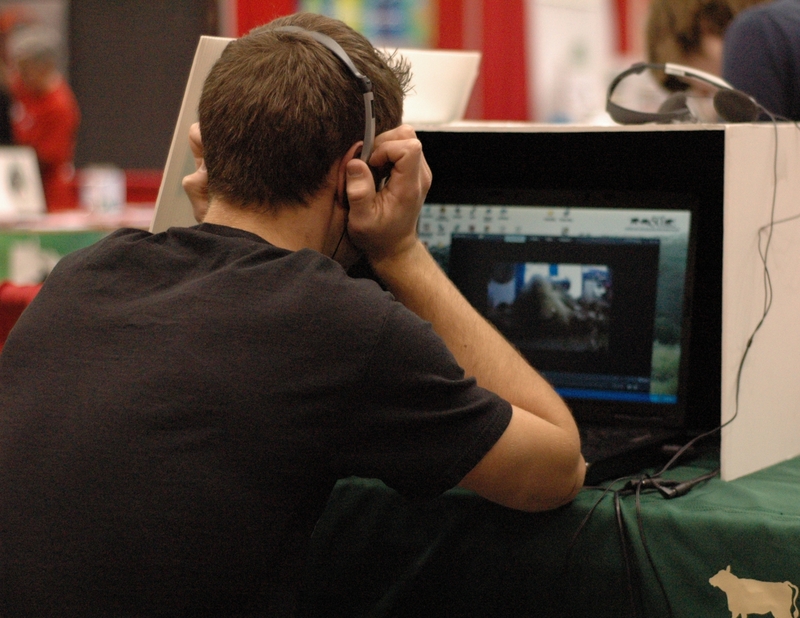 With headphones on and a privacy enclosure around the screen, viewers are intimately engaged in what they are seeing. Viewers often tear up or become angry after watching the video, and our volunteers turn that passion into action by encouraging them to decrease their consumption of animal products and work towards a vegan diet. Follow-up surveys demonstrate that over 50% of respondents reduced animal product consumption after watching the video. 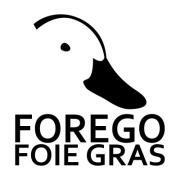 ARC’s Forego Foie Gras campaign received a grant from the Humane Research Council to research attitudes toward foie gras among Twin Cities diners. The results of the survey overwhelmingly prove that Minnesotans oppose this cruel product and prefer to patronize foie gras free establishments. Three-quarters (74%) of Twin Cities residents support a ban on foie gras production in the state of Minnesota, and after learning about how foie gras is produced, nearly half (45%) of respondents said they would avoid dining at restaurants that serve foie gras. Read more about the survey results. On Saturday, March 31 from 10:30am to 2:30pm, the Animal Rights Coalition is joining Whole Foods Market in Minnetonka (1001 Plymouth Road, Minnetonka, MN) to create a day dedicated to sampling and learning about vegan food and the importance of compassion towards animals. Senate File (S.F.) 462 and House File (H.F.) 702, known as the Dog and Cat Regulation Bill, were the bills introduced in 2011 for the 2011-2012 Minnesota Legislative Session to license and regulate commercial dog and cat breeders in Minnesota. 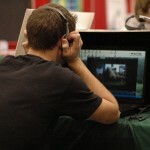 The session ended on May 10, 2012 and neither bill was granted a hearing. The bills did not progress and were not voted on. 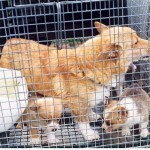 A new bill to license and regulate commercial dog and cat breeders will be introduced in January 2013 for the 2013-2014 Minnesota Legislative Session. Even though the 2011-2012 session has ended, legislators still welcome input from constituents during the interim. Please know that re-districting and the upcoming November 2012 election may change who represents you. Find contact information for your legislators and call, write or email them. 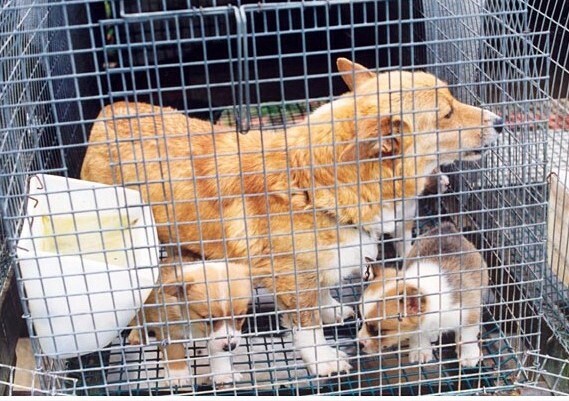 Tell them you’re a constituent and are contacting them about inhumane dog and cat breeding in the State of Minnesota and the fact that Minnesota has no state laws to regulate commercial dog and cat breeders. Ask them to support legislation to license, inspect, and enforce standards of care for commercial dog and cat breeders in Minnesota. Read more about this issue and puppy and kitten mills in Minnesota here. 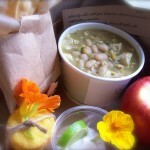 By popular demand, here is the recipe for the the delicious and easy to make White Chili with Homemade Tortilla Chips & Cilantro/Lime Mock Sour Cream served at the December ARC holiday open house by Rhymes With Vegan Chef Meagan Holtgrewe, and the Layered Vegan Taco Dip and Mini Taco Salads that were served. Enjoy! The “ag-gag” bills, S.F. 1118/H.F. 1369, are still alive when the Minnesota Legislature convenes January 24 and may come up for hearings this session.. These bills would make it illegal for someone to enter a farm or animal-producing facility and take videos or photos without the owner’s permission. The bills would make even just possessing and distributing these videos or photos a crime. The bills did not pass in 2011 because many people, including the news media, thought they were unconstitutional. Fur Free Friday and Compassionate Caroling! We had a great start to the fur protest season with Fur Free Friday at Ribnick’s the day after Thanksgiving (see the photo of our youngest protester, Grace), and we kept up the momentum with compassionate caroling in December where carolers raised their voices against the cruel fur trade.